Shirts With Random Triangles: Georgia Adds Isaac Nauta, No. 1 Tight End Prospect For 2016, To Its 2016 Recruiting Class. Georgia Adds Isaac Nauta, No. 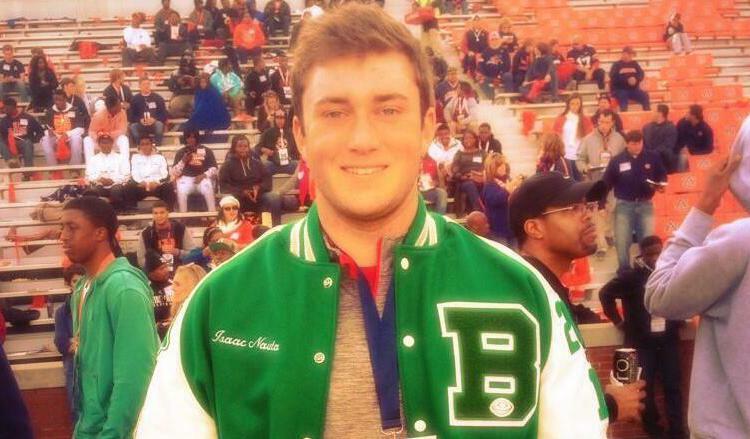 1 Tight End Prospect For 2016, To Its 2016 Recruiting Class. Isaac Nauta. Image via gamedayr.com. Score a huge 2016 recruiting win for Georgia. Issac Nauta, ranked by 247Sports as the no. 1 tight end prospect for 2016, committed to the Bulldogs on Saturday. Nauta made his announcement at the 2016 U.S. Army All-American Bowl game, held at the Alamodome in San Antonio, Tx. He becomes the 16th member of the Dawgs' 2016 recruiting class. Nauta had previously committed to Florida State, but announced his decommitment from the Seminoles on July 28, 2015. 247Sports grades Nauta as a composite five-star tight end prospect. In addition ranking Nauta as the no. 1 tight end prospect for 2016, the recruiting website ranks the tight end prospect at no. 3 among 2016 prospects from the state of Georgia, and at no. 9 in its composite rankings of 2016 prospects nationally. A native of Buford, Ga. Nauta currently attends IMG Academy in Bradenton, Fl. He formerly attended Buford High School in Buford, Ga., where he was part of the Georgia 4A State Championship team in 2014, and the Georgia 3A State Championship Teams of 2012 and 2013. Nauta stands 6'3.25, and weighs 244 lbs.